CGC 9.8 BATMAN #497 .. BANE BREAKS BATMAN'S BACK .. CLASSIC COVER .. 1993 ..
Batman 497 (1993) 2ND PRINT!!! EXTREME HIGH GRADE!!! CGC 9.6 BATMAN #497 .. BANE BREAKS BATMAN'S BACK .. CLASSIC COVER .. 1993 ..
CGC 9.4 BATMAN #497 .. BANE BREAKS BATMAN'S BACK .. CLASSIC COVER .. 1993 ..
DC COMICS BATMAN #497 1993 - BANE BREAKS BATMAN'S BACK. 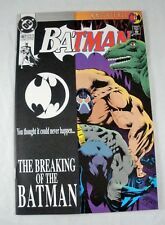 Batman #497 NM- 9.2 DC High Grade Batman 1993 No Reserve Bane Cover!!! This page was last updated: 25-Apr 13:39. Number of bids and bid amounts may be slightly out of date. See each listing for international shipping options and costs.